Recently a group of researchers from the U.S. Department of Agriculture decided to see what would happen if they removed seating structures from a playground in Grand Forks, North Dakota. Not surprisingly, once the benches were taken away, adults hanging out with their kids at the park became more active and played more with their kiddos. Plus, though you might think so, removing seating did not shorten the length of time that adults were willing to let children stay at the park and play. Now, just in case your local park has benches, you can adjust on your own. When taking kids to the park, don’t take a book or surf your phone. You can pretend the park is seating-free and make it a goal to keep active while your kids do. If kids are engaged with other kids (that’s a good thing) it’s not necessary to interrupt their fun, but you can swing (pump those legs), jog around or try pull-ups on the bars. Remember too, parks aren’t the only place to go. You can have a nature adventure with your child, go geocaching or hiking, all of which helps keep your whole family active and healthy. Recently a group of researchers from the U.S. Department of Agriculture decided to see what would happen if they removed seating structures from a playground in Grand Forks, North Dakota. Not surprisingly, once the benches were taken away, adults hanging out with their kids at the park became more active and played more with their kiddos. Plus, though you might think so, removing seating did not shorten the length of time that adults were willing to let children stay at the park and play. Now, just in case your local park has benches, you can adjust on your own. When taking kids to the park, don't take a book or surf your phone. 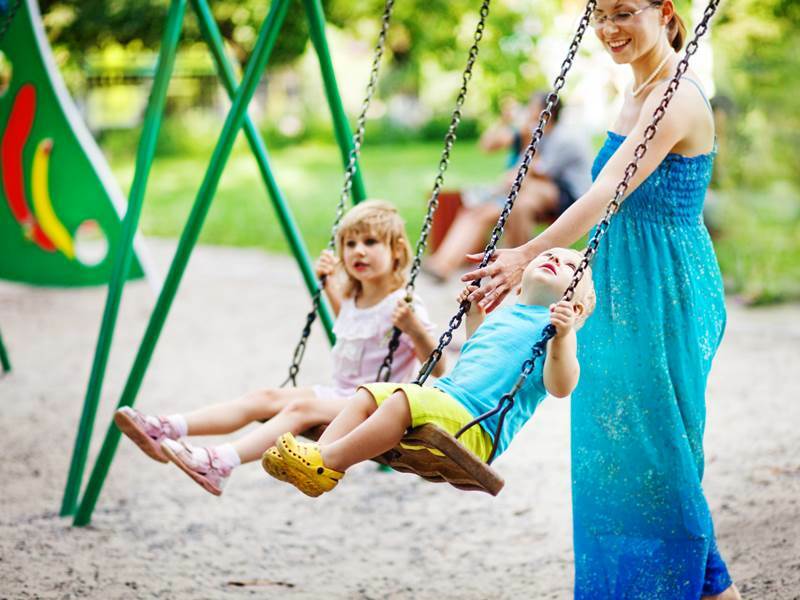 You can pretend the park is seating-free and make it a goal to keep active while your kids do. If kids are engaged with other kids (that's a good thing) it's not necessary to interrupt their fun, but you can swing (pump those legs), jog around or try pull-ups on the bars. Remember too, parks aren't the only place to go. You can have a nature adventure with your child, go geocaching or hiking, all of which helps keep your whole family active and healthy.